It’s not hard to find new opinions about how you should be investing. Everyone’s got an angle on what the stock market is going to do next, which company is set to take off, and which mix of investments is bound to outperform. It can be confusing. With all that information out there and all the options at your disposal, how do you decide what to do? How do you separate the good investments from the bad ones? And how do you decide which ones are right for your specific goals? 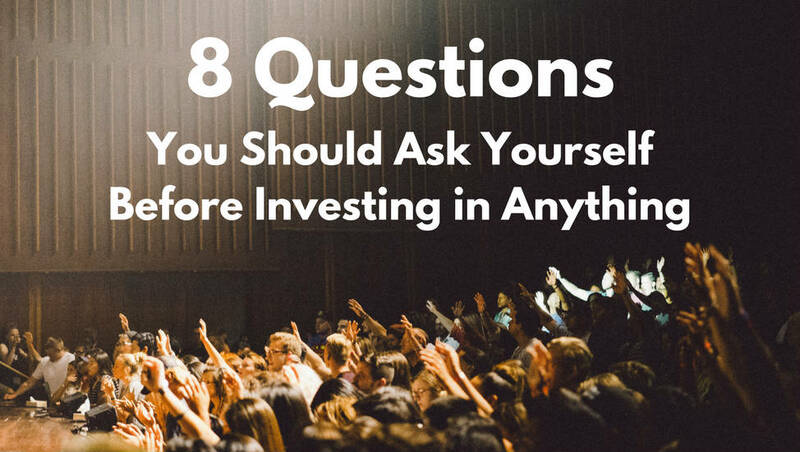 There’s no surefire way to do it, but here are 8 questions that will help you make better decisions when choosing what to invest in and what to avoid. 1. Do I understand how this works? I don’t care how good something sounds. If I don’t completely understand how it works, I won’t invest in it. There’s something about the investment that the person is trying to hide. On top of that, one of the biggest keys to investing well is sticking to your plan through the ups and downs. That’s not easy. Even the best investment strategies have big down periods that make you think twice. Sticking to your plan in those tough times requires an almost religious-like belief that things will turn around. And the ONLY way to have that kind of conviction is to understand why you’re investing the way you are and what each piece of your plan is doing for you. Without that strong understanding, you’ll almost certainly bail at the first sign of trouble. Simply put, the less an investment costs the more likely it is to produce positive returns. That doesn’t mean that the cheaper investment is always better. But it does mean you need a good reason to invest in something that costs more. Every extra dollar you pay to invest is a dollar that can’t be used to fund your biggest goals. 3. How does it fit into my overall plan? Imagine making a meal by throwing all your favorite foods into one big pot. For me, I’d probably start with cheeseburger, add a dash of sausage, pepper, and onion pizza, a pinch of buffalo wings, and top it off with a nice big brisket and some bleu cheese dressing. Each of those foods is delicious, but adding them together would probably be pretty gross. Investing is the same way. It’s not about picking a bunch of great investments. It’s about picking a set of investments that work well together to help you reach your goals. For example, I have a couple of investments in my personal investment plan that I know will produce relatively low returns over the long term. But they fit into my overall plan because they provide balance. When the higher-returning investments are in one of their inevitable down cycles, these more conservative investments should provide some protection. Not ALL of my investments will be losing money all at once. So before you say yes to any particular investment, consider how it fits into your overall plan. Because it’s never about how any individual investment performs. It’s about how all the pieces fit together to work towards a common goal. Want more detailed investment guidance? Check out the step-by-step guide: Investing Made Simple. 4. Am I in this for the long term? We’re constantly bombarded with new information. And because it’s new, it often feels urgent and authoritative, as if this new information changes everything we thought we knew about the world. This is especially true in the world of investing, where there are the always new opinions about the future direction of the stock market, which companies are hot and cold, and which new strategy can deliver amazing returns with no risk. With all of this information flying around, it’s tempting to make a lot of short-term investment decisions based on what you think is a newer, better understanding of the world. Unfortunately, that almost never works out. There are many reasons why this kind of market timing doesn’t work, but all you really need to know is that it fails about 80% of the time. The investors who succeed are the ones who seek out investments they want to hold forever. 5. What is its track record? Projections – A prediction for how the investment will perform going forward. This is an especially big piece of any whole life insurance pitch. Back-Tested Returns – When someone comes up with a new investment strategy, they can’t tell you how it DID perform because it didn’t exist until now. But they CAN, and do, run simulations showing how it “would have” performed in the past. Both of these are problematic. Projections are an issue because no one can accurately predict the future, because anyone selling you anything is going to give you an optimistic projection, and because they sneakily avoid the question about how the investment has actually performed in the past. Back-tested returns are problematic because you can never be sure whether the testing was done legitimately (i.e. creating a hypothesis first and testing it enough times over a large enough data set) or whether it was simply data-mining (see here and here for more). While past performance is never a guarantee of future performance, it’s much better if you can evaluate an investment that actually has a history. That way you can see how it actually DID perform in different conditions and make a more informed decision about its prospects going forward. 6. What is the possible downside? If things go bad, how bad can they go? All else being equal, the option with the smaller downside is likely to be preferable. If you invest in the stock of a single company, that company could go bankrupt and you could lose all of your money. But if you invest in an index fund that spreads your money across the entire US stock market, the odds of losing all your money are virtually non-existent. If you invest in a whole life insurance policy and down the line your situation changes and you can’t afford the premiums, the policy will eventually lapse and become worthless. But if you instead contribute to a 401(k), IRA, or other investment account, you could simply pause your contributions and the money in the account would keep growing. There is risk inherent in every investment. But some investments have bigger risks than others. 7. How easily can I get out of it? No matter how much research and planning you do, you’ll likely make a few investment decisions you regret. With some investments, correcting the mistake is as simple as clicking a few buttons to sell it so you can invest in something else. With others, there may be fees involved, or surrender charges, or you may not even be able to sell at all for a certain period of time. The easier it is to get out of an investment, the less risk there is in getting in. 8. Am I already “good enough”? Remember, you don’t have to find the perfect investment strategy. All you need is an investment plan that’s good enough to help you reach your personal goals. If you’ve already done your homework and have a “good enough” plan in place, there likely isn’t any reason to change things up (unless something in your life has changed significantly). So sit tight and appreciate the fact that you already have your act together. Because in most cases, “no” is the right answer to any new investment opportunity that comes along. I really appreciate the last question. Important to remember that money and investments are tools that serve you however you wield them. If your handsaw gets the job done and fits in the space, you may not need a chainsaw that would be hard to angle in. Nice set of questions Matt. I tried applying these retrospectively to a couple of investments I’ve made in the past that didn’t go well. I think in one case I screwed up on #3, how does it fit in my overall plan. In another case, I didn’t apply stringently enough #1, do I understand how this works? Now I just need to train myself to have the discipline to ask the questions before, not after, investing. :/ Thanks! It’s not always easy. I’ve been tempted myself by investments that sound great, even though I don’t fully understand how they work. That’s why I made it question #1 here. It really has to be the baseline. That Warren Buffett quote is so insightful! Really makes me think. Really agree with that last point. When it comes to investments, yes is often not the right answer. Great article!